Social media is a great avenue for brands to create awareness about what they do. For brands with tangible products, in industries like Auto, QSR, Food and Bev etc, it is easier to project what you want your consumers to remember. For instance, think of how central the Coca-Cola bottle is to all their campaigns. They can build on to this easily identifiable object the ‘feeling’ they want you to associate with the brand and the product. Insurance companies, on the other hand, have their job cut out for them. There is no ‘real’ product. Visually communicating their services and the ideals they stand for is challenging. However, social media offers insurance companies a chance to construct themselves as human. This can have a definite bearing on brand awareness and customer sentiment. 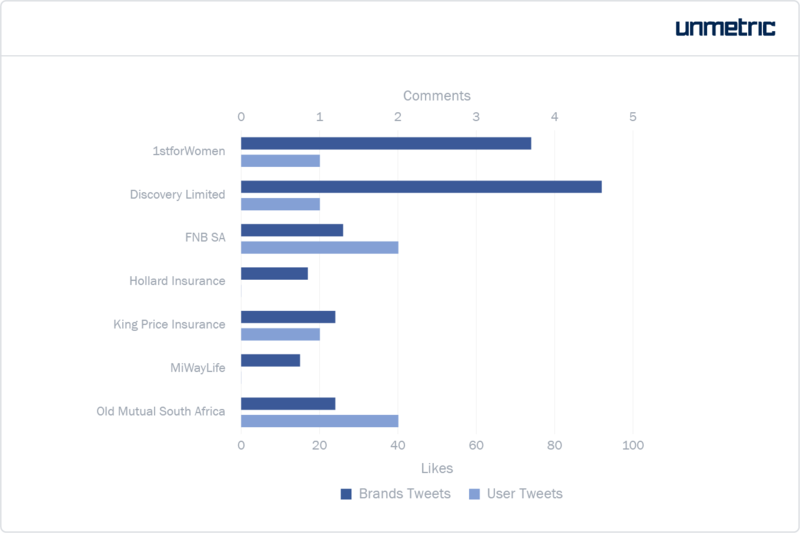 In this article, we take a close look at how some of the top South African insurance companies use social media to engage their audience. Brands analyzed include: 1st for Women, Budget, Dial Direct, Discovery, FNB, Hippo, Hollard, Iwyze, King Price Insurance, Miway, Momentum, OUTsurance, Old Mutual, Prime Meridian and Santam. Here are some general trends we observed from their performance during 1st April – 30th June 2017. Insurance companies get the most engagement on Facebook. The average interactions on this network was 314, compared to a meager 13 on Twitter and 41 on Instagram. More than half of all the content published across networks comprises photos. Photos and GIFs fetched the best engagement on Facebook. These received 1,280 and 296 interactions per post, respectively. Videos got outstanding engagement on Twitter. These brought in an average of 37 interactions compared to the overall average of 13. On Instagram, insurance brands posted thrice the number of photos as videos. These fetched 1.5 times more average interactions than the latter. All of the insurance brands studied here had a presence on Facebook. Take a look at what these companies use this social network for and how effectively. 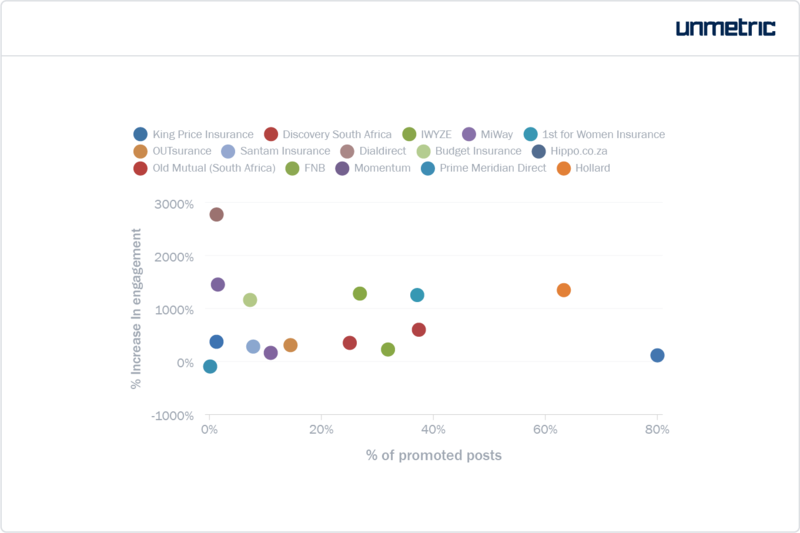 Hollard got the most interactions per post, overall. They also had the most likes per post. However, OUTsurance took the lead in the average shares per post. Engagement on its own does not reveal any actionable insights. It is important to understand what elements of these brands’ social media strategy paid off. On average, the brands studied here posted 57 times to Facebook during the quarter. 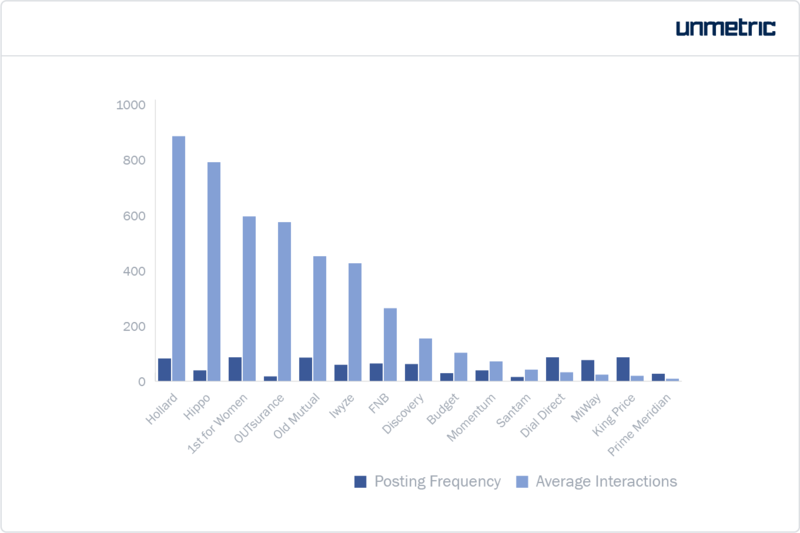 The chart below shows the number of posts published by a brand and the interactions per post that they generate. This way we can see if there is a correlation between post frequency and engagement. What we found though was that the correlation between the posting frequency and the average interactions received by these brands was negligible. For this set of brands and for the time period analyzed, we can confidently say that posting frequency does not matter on Facebook when it comes to engagement. More and more brands now promote their content to ensure that it reaches a wider audience. This defeats the logic of posting lots to boost total engagement. Dialdirect and Miway promoted just one post each. These performed significantly better than their organic posts. However, brands can’t bank on one promoted post alone for engaging their audience during a three-month period. It is important that you maintain visibility and hold their attention consistently. We will discuss their content strategy in greater detail in a following section. 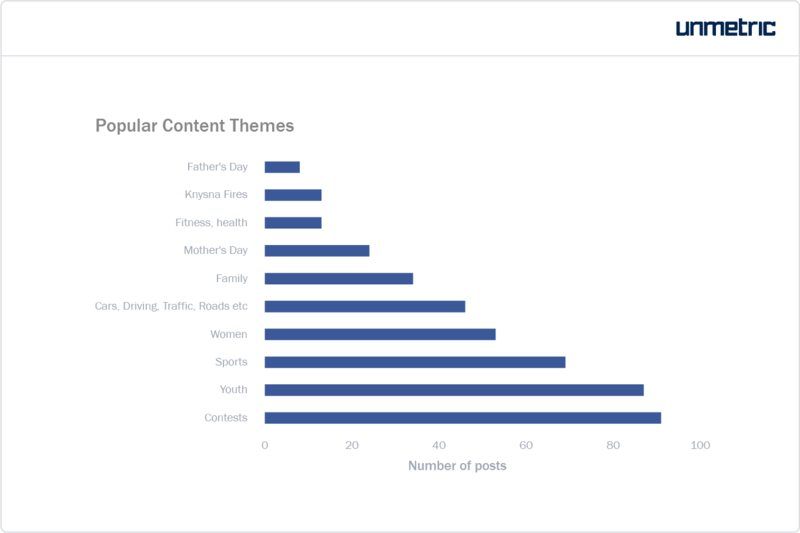 Hippo, however, promoted the highest percentage of their Facebook content (80%). Though this didn’t fetch them an astounding surge in engagement, Hippo’s promoted posts seemed to give extra momentum to their organic efforts as well. Hippo’s strategy of promoting a large chunk of their content makes sense when you consider their audience size. They have a fan size that’s shy of 20,000, and the lowest in the group. The odds of their posts getting through to a large audience are stacked against them. With promotion however, their posts receive a wider spread. 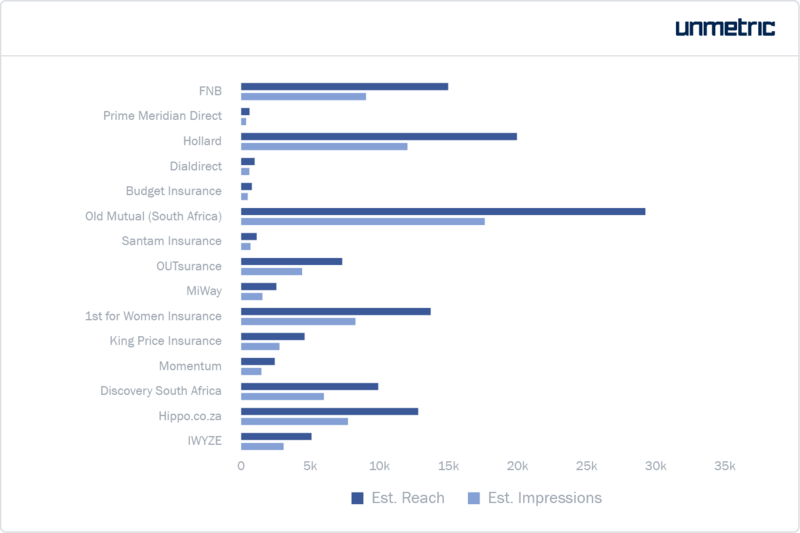 Old Mutual is the only brand that enjoys a larger audience per post, based on our reach and impression estimates. The easiest way to uncover a brand’s social media goals is to analyze their campaigns. Campaigns indicate what each brand is focusing on during a particular period. Further, the way campaigns are structured show what the brand is after – interactions, page likes, reach etc. Both 1st for Women Insurance and Hollard’s campaigns involved contests. Using contests is a great way to ensure that your audience interacts with your content. You are giving them an incentive to pay attention to all your content. But brands who do contests for the sake of interactions do not benefit from them in the long run. The key is to use contests in amplifying what your core message is. This is precisely what 1st for Women Insurance and Hollard have done. As an insurance company that solely caters to women, 1st for Women Insurance found content success by welcoming content around women who have a great amount of significance to their audiences. The brand can then repurpose this content sent in by participants in their content creation efforts. In order to attract more attention to the campaign, they included a feature on an influencer (see post below). The post clinched the most likes on a single post among all the brand posts studied here. The brand’s values are made relatable by association. That is, when your audience sends in a picture of a woman they know and respect, her qualities come to be associated with your brand. Since it is somebody that they personally know, this builds an emotive connection. A significant portion of Hollard’s content targets young people. Their campaign #StreetWiseFinance employs a great strategy to target this demographic – games. As part of this campaign, they created an elaborate game (vaguely like Monopoly) based on the principles of personal finance. This includes managing a budget, insurance, lending, saving etc. This way, Hollard can underline the importance of the services they provide and generate better awareness. A big reason behind their campaign success, and overall engagement, is because they targeted and addressed a specific audience in each post. Most of these topics cater to a specific audience. With Facebook’s targeting capabilities, you can ensure that the content reaches the most relevant audience. To find out what topics are gaining traction on social media in your industry, visit Discover. Brands use different networks differently and for different purposes. 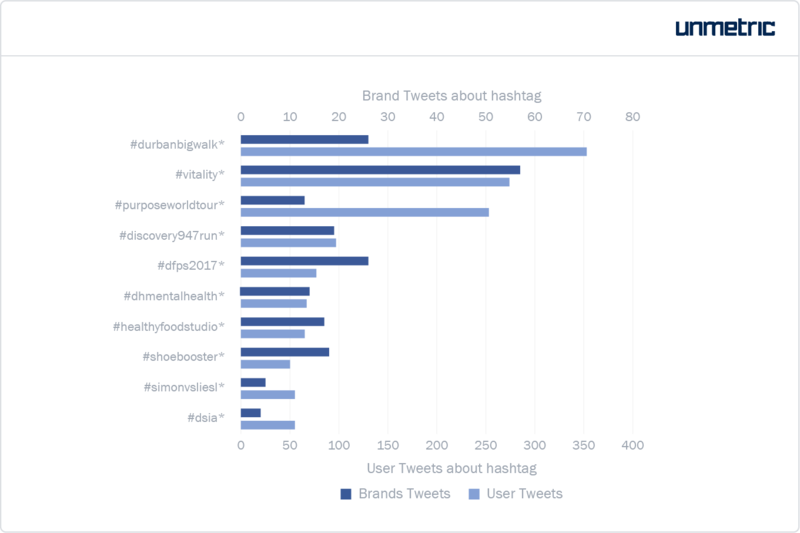 Here, let us take a closer look at what these insurance brands were up to on Twitter and analyze the strategies that were successful. Discovery received the most engagement overall. However, this was also because they posted around 400 times during the period studied here. 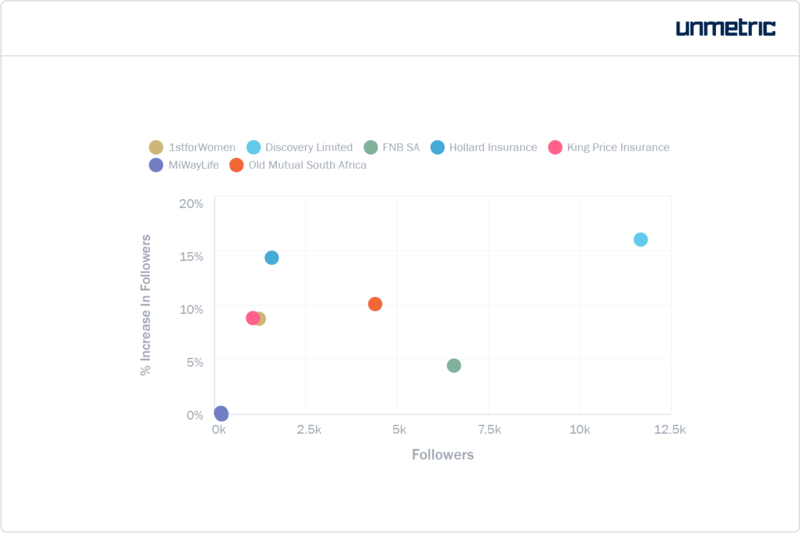 In terms of average engagement, OUTsurance ranked first. 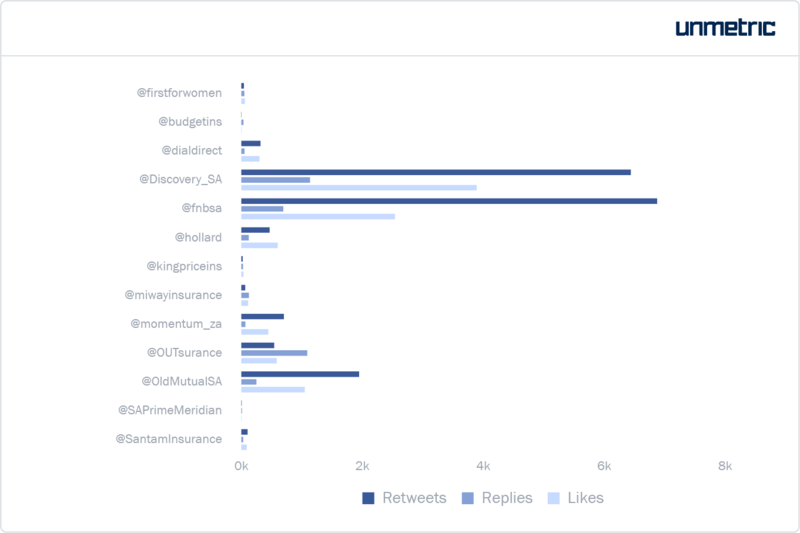 While Discovery received around 30 interactions per tweet, OUTsurance notched up 164 interactions on average. FNB also performed fairly well with 74 interactions per tweet. FNB shared the news about being voted the coolest bank, 6th year in a row. The tweet was sponsored via Twitter Ads, which could be another reason for the high likes count. We apologise for our Father’s Day video. It did not appropriately represent SA’s demographics. It was an unintentional oversight. OUTsurance retracted the video they’d posted to their social channels in connection with Father’s Day. They drew flak for not adequately representing all ethnicities. This composed the majority of replies they received. It is also the main reason why they got so many interactions (mostly replies) from so few posts. Social media has given consumers a voice like never before. Any content that brands produce must not only be looked at from a branding or messaging point of view. Steps need to be taken to ensure it is reviewed to take into consideration current situations, diversity and equality. As Pepsi found out with their recent ad featuring Kylie Jenner, a brand must be sensitive about how it inserts itself into a conversation – or whether it should do so all. Discovery were one of the main sponsors of Justin Bieber’s Purpose World Tour in South Africa. They cashed in on the hype around the event to win engagement on Twitter. Could all of Discovery’s engagement be because of this one event? Let’s explore. You can see that most of these hashtags are associated with an event – like the Durban Big Walk or the Purpose World Tour. These receive a lot of user tweets and engagement (see chart below). So does their approach of using celebrity ambassadors (see chart below). The popularity of the hashtag ‘#vitality’, for instance, was on account of their ambassador Chad Le Clos’ stunning performance at the Olympics. 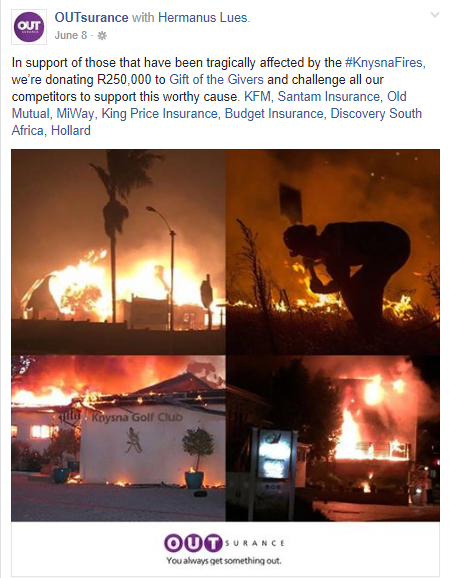 Insurance brands in South Africa have not yet completely embraced Instagram. Of the brands studied here, only 7 had a presence on this network. Discovery had the largest audience size and the highest growth rate. 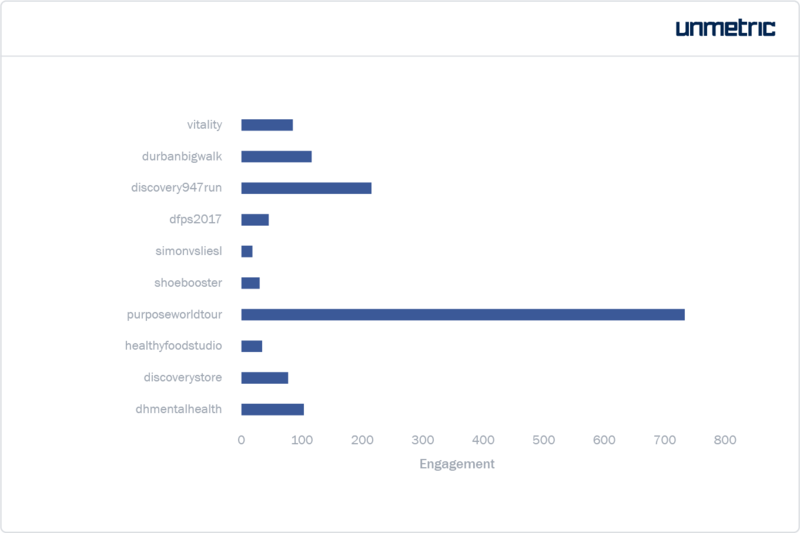 Discovery topped the engagement tables on Instagram as well. They had the most likes per post. 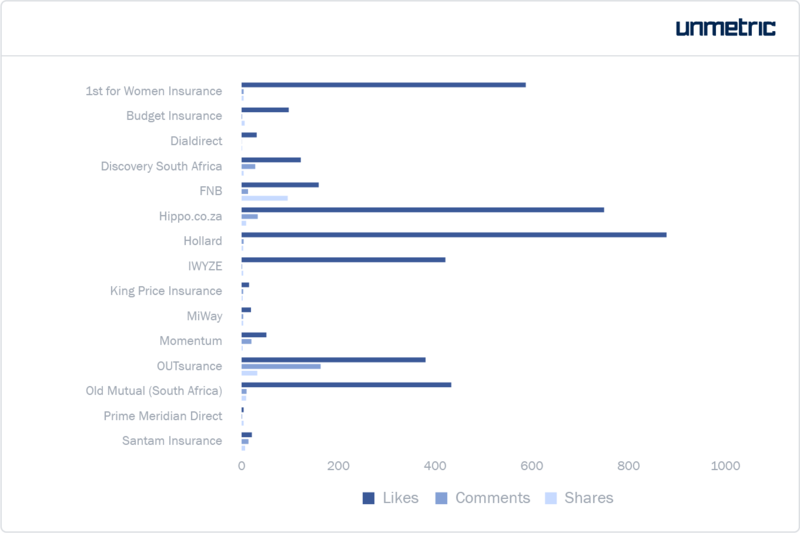 However, Old Mutual had the most comments per post. “B-You are an example of what a true woman is: courage, strength, beauty and love. You always protect those who have no words to do so for themselves.” Join Baradi Moletsane and celebrate an inspirational woman in your life. Tell her something you wish she knew about herself and you could win a photoshoot to the value of R15 000. #YouFirst Enter using the link in our bio. Ts&Cs apply. 1st for Women saw great engagement, posting their best performing Facebook content on Instagram as well. This is a safe strategy for other brands to try out as well. COMPETITON TIME: Win 2X tickets to the #OMTWS2017. Keen? Follow these simple instructions: 1. Find the words describing our event in the crossword. 2. Visit our Instagram page and follow our account. 3. Find this post on our feed. 4. Comment using the winning word that you found. It’s that easy. Good luck  t’s and c’s apply. Competition closes 6 June 2017. Old Mutual used the contest format to get more people to visit their brand page and to drive up engagement. However, Discovery consistently received likes on their posts. 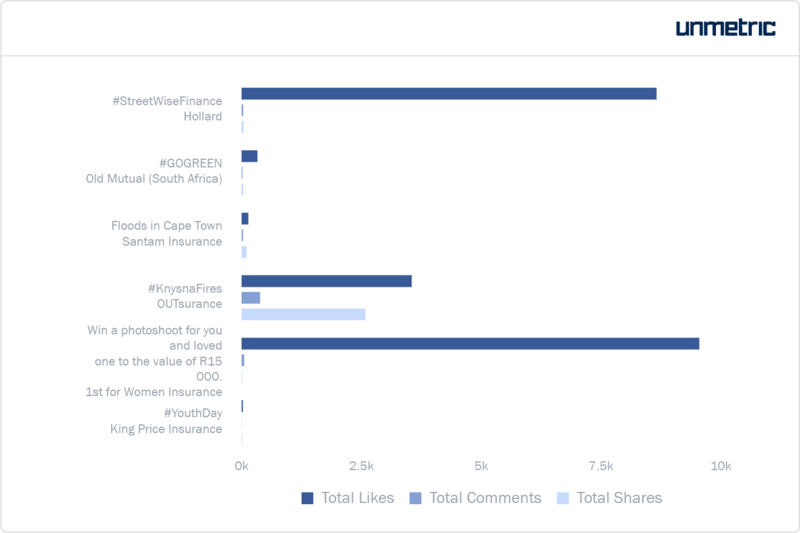 They led in likes per post despite having posted 97 times (second only to Old Mutual). Here again, they’ve leveraged the fan following of their vitality ambassador, Wayde van Niekerk. Several of their posts featured other star athletes. In conclusion, social media success seems to follow the brands that have actively constructed a personality. The insurance brands studied here used themes related to sports, youth, women etc to underline their prime focus. By talking about these topics, they establish themselves as stakeholders. This way, they can be part of a community with their target audience. Thereby, they can address pain-points, lend sympathy and even establish themselves as thought-leaders. To gain more data-backed insights on your industry’s social media performance, check out Analyze.